Pirate Packs started helping children in February of 2012. We are supported through donations from the community and several monetary grants. Pirate Packs was started so that at-risk children would have food for the weekend. These children are on free or reduced lunches and breakfast at school. By providing food for the weekend, we hope to achieve a better learning environment. It is proven that children pay attention and are more eager to learn when properly fed. It is our goal to make sure that the children are fed and ready to learn come Monday morning. For the first several years, we served kids at Frank Nicholas Elementary. Beginning January 8, 2016, we began serving students in all seven district schools including the ECC, Middle School and High School. Several changes have been made to try and help us reach out to assist more students. 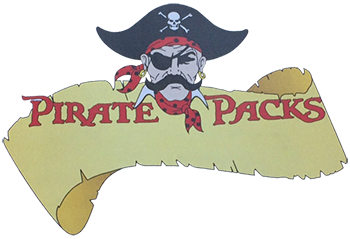 We have a new board of directors and we are using social media like this site and facebook to get the word out about Pirate Packs. We became a 501c3 organization in September 2015. This allows all donations to be tax deductable and we believe it give us the ability to achieve greater stability for the future. If you know any of the members of our board listed below, feel free to ask them about how you can help us fulfill our mission of feeding students in West Carrollton Schools.